Resonators are a breed that could use some new life. Let’s not even talk about Ableton Live – use one of the presets in the built-in effect in that software, and any producers are likely to perk up their ears – and turn up their nose. But that’s why it’s nice to see the latest effort from Artemiy Pavlov and Sinevibes. The Ukrainian developer has just been on a roll lately with clever, Mac-friendly (Retina Display, even) creative plug-ins. And the latest is a fresh twist on a resonator. Six tuned resonators already makes a nice resonator plug-in, but Hexonator also doubles as a sequencer. With 32-step chord sequencing and timing options, you can create some really elaborate effects. And you do this via the sort of unusual, animated UI that is Sinevibes’ signature. Six melodically tuned resonators with positive/negative feedback, adjustable bandwidth. 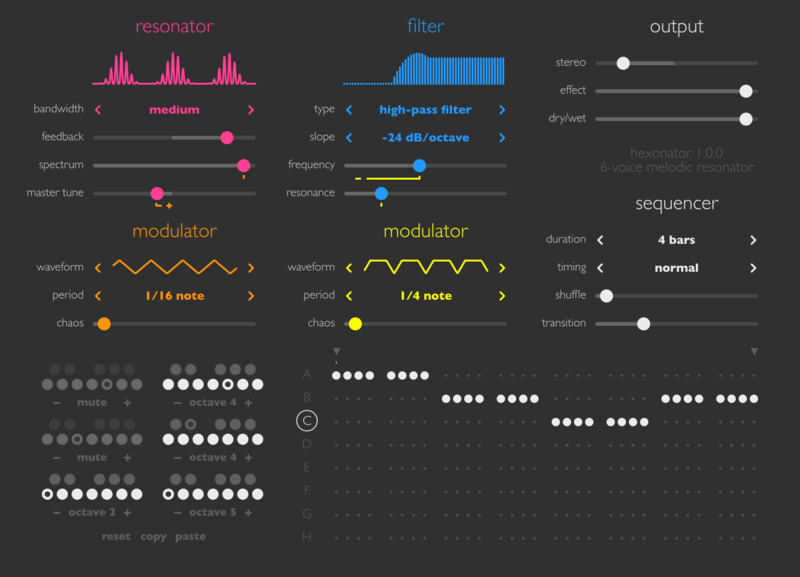 Chord sequencer with up to 32 steps, variable timing, shuffle and glide. Multi-mode filter: low-pass, band-pass, and high-pass at -12 dB and -24 dB per octave. Two modulators with 8 waveforms and adjustable chaos. Go have at it. US$39 or available in a bundle; demo version available.